Spring Giveaway! 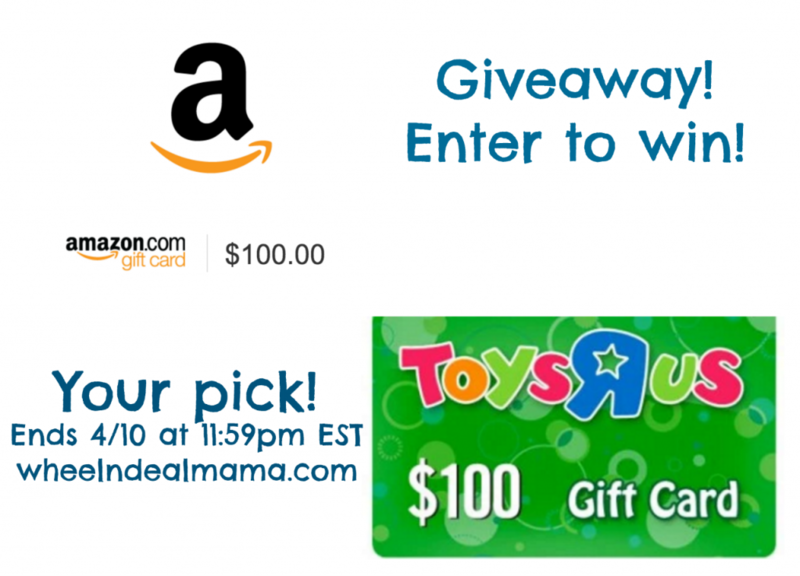 Enter to win $100 to Amazon or Toys R Us! Your Pick! Giveaway time!!! Who wants to win an extra $100 to spend on Amazon or Toys R Us?! Well here’s your shot!! Right now I am giving away a gift card to either one, YOU pick!! Even better? IF we get over 400 individual people entering (you will be able to tell from the individual comments on the post! ), I will give away BOTH! One winner will get the Amazon Gift card and one will get the Toys R Us! It has been a bit slower on the blog over the past few months, but that is changing so get ready for all kinds of new and exciting things 🙂 Oh, and don’t forget I have a facebook giveaway going on this week too! Amazon gift card for me!!! Amazon gift card would be my preference. Amazon would be great. Thanks for the chance. Toys r us for my kids! I would love to win and I would pick the amazon gift card. Thanks for the chance. I would get the Toys R Us card! Amazon please. Ty for a giveaway! I would choose the $100 Gift Card to Amazon. I would love to win the $100 Amazon gift card, I can find almost everthing I’m looking for on there. And have it delivered right to my door. My choice would be Amazon. I would pick Amazon gift card! Thanks for this awesome chance! I would love to win a Amazon gift card – love to shop . Thanks for the amazing giveaways!!! I would choose Amazon! Thanks for the chance to win! I would definitely choose Amazon. Thanks for the awesome giveaway! An Amazon gift card would be so amazing right now!! I’d choose Amazon. I have so many things on my wish list and so little money. 🙂 Too much window shopping I guess. I would love Amazon! Hubby loves to shop online with Amazon! The toys r us jne! My son has been eyeing the firetruck power wheel and we are saving up to surprise him for his 4th birthday! I would pick the Amazon card. I would love either an amazon gift card or a toys r us gift card. Amazon, My kids have enough stuff. Mothers Day is coming next so I’s my turn. I would choose the Amazon gift card. Thank you so much for the chance!! I would love Amazon please! kristiedonelson(at)gmail(dot)com Thank you! I love Amazon, it is always my first choice!!!! Thanks for the choice. I’d love the Amazon gift card! My choice would be Amazon as I am saving for something I need that is a bit costly.